We've all seen shrinking products in the grocery store -- where a roll of paper towels or a jar of pasta sauce gets smaller -- but shrinking products get obvious after awhile. After all, if a jar of spaghetti sauce gets much smaller, you would need to buy two. So manufactures now have some new tricks up their sleeves. Imagine buying a frozen pepperoni pizza, and finding pepperoni on just one half, that half under the clear see-through window. That's one of the deceptive grocery products highlighted in a new report from TwentyTwoWords.com. It's not just food getting downsized. The report showed a box of children's markers, where hidden under the label, in the middle of the clear plastic box, was just cardboard and air. Air is big these days. Hair gel jars and tubes do a great job of disguising the amount of product inside. And be especially careful with bags of tortilla chips. With some, if you turn it upside down you reveal a bag that is two-thirds air (though manufacturers insist air is needed to keep the chips from breaking). So you may want to be skeptical of "windows" on product bags or boxes. 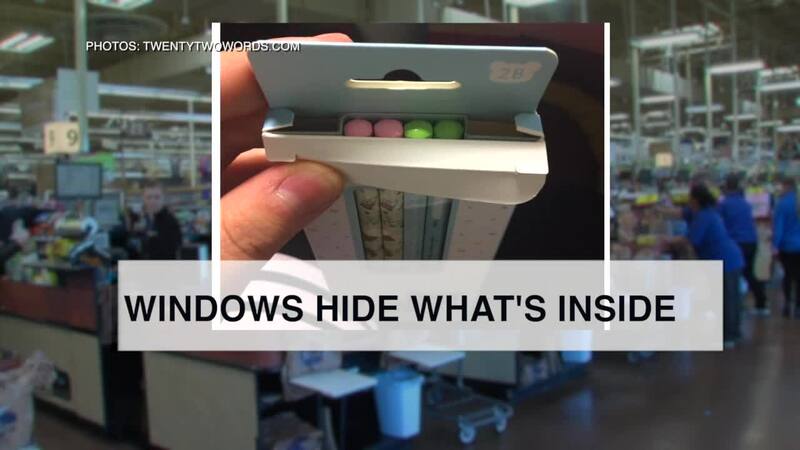 They often are designed to hide what's inside, according to the report in TwentyTwoWords. That's a lot more deceptive than just shrinking the jar or bag that in the old days would leave you saying, "doesn't that stink?" Now you have to check behind the wizard's curtain, to see how they hid the shrinking product. If you open a product and find hidden space, or cardboard that should have been product, call and complain -- then try another brand so you don't waste your money.